Dr. Ajay completed his MD in Dermatology from Bombay University and went ahead to pursue his Fellowship from National Skin Centre, Singapore in 1997 in General Dermatology and Laser Surgery. He holds a Diploma in Dermatology from Royal College of Physicians, Glasgow, UK, which he completed in 2008. 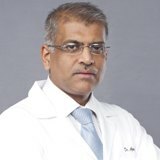 Dr. Ajay has an excellent track record of over 20 years in lasers and dermatosurgery. His expertise also extends to vitiligo surgery and he takes special interest in paediatric dermatology. He has multiple papers published in in various index journals and has also authored a textbook on dermatology which was published in Mumbai in 2000. He has a rich experience of more than 8years in Mumbai and more than 11 years in the UAE.